The book is remarkably short – just 135 pages – and can be read within three or four hours. It is beautifully laid out with clear chapters each with a brief introduction followed by logically arranged headings and subheadings. Key points are highlighted in concise text boxes. Reading this book would benefit all doctors both junior and senior. Why? Because the work of all doctors is inextricably linked with the law. Every time we meet a patient we have a Duty of Care. Every interaction with a patient (whether in person or in writing) might one day be scrutinised in a negligence claim. We have to interact with police enquiries and coroners’ inquests. Some of our patients have issues with mental capacity for which clear legal laws apply. We face issues of consent for transfusion and unconscious patients. General Data Protection Rules are the latest threat to our peace of mind. Many doctors probably feel threatened or even hostile to the legal profession. Perhaps the doctor fears unfair scrutiny of his work, more for the gain of the lawyer than the patient. This book goes a long way to dispelling this misconception. By reading the book, a doctor will understand the legal context of clinical practice. The book starts with an explanation of how lawyers and the Court examine evidence (be it oral or written) in a tidy, logical and forensic way. By understanding this, a doctor’s record keeping will inevitably improve and will provide a robust defence at a later date were his clinical practice to be questioned. Having read this book, there is no doubt that I will spend more time recording all key clinical findings, more fully explaining consent and to explain explicitly my clinical reasoning for any particular decision or recommendation. The book also talks the reader through the process followed when things go wrong in clinical practice. Genuine mistakes rather than negligent errors are common; the obligation for Duty of Candour is emphasised-; it does not mean an admission of negligence. If things go properly awry, then the Author explains how to engage with the potential clinical negligence process, Fitness to Practise assessment or disciplinary proceeding. The book briefly and clearly explains long-standing and also more recent legal judgments such as Bolam, Bolitho, Montgomery, Thefaut and more recently Hassell. With each judgment, a doctors’ obligation to provide clear, logical patient-orientated advice has become more and more established. Whilst this might on the face of it make a doctor feel more insecure, in reality by understanding the simple principles outlined in this book, the doctor should become more immune to legal scrutiny. Another strength of this book is the repeated emphasis on how established good medical practice as defined by the GMC merely reflects the expectation of the law. Simply by following good medical practice much of the perceived threat of litigation will just fall away. Even though I have been in consultant practice for over 20 years and an Expert to the Court on medical negligence cases for several years, I found countless wise tips which I will integrate into my practice. These will include routinely recording my logic on every decision, making sure that informed consent is viewed entirely from the patient’s perspective, and writing to the patient in clear non-medical terms rather than to the GP in medical terms after a clinical consultation. This really is an excellent practical guide and I would recommend it wholeheartedly to all doctors. It is a gentle, easy read and yet so apposite to current practice. The book is a fantastic resource for clinical medical students and junior doctors alike. I have already encountered some of the topics covered such as providing witness statements for injuries for patients I’ve treated in A&E and having this would have made the experience significantly less daunting. It has also changed the way I think about my documentation. Despite considering myself someone who documented well previously I note following reading this the absence of documentation in many cases of the reasons behind decisions from senior clinicians (often due to shortage of time on a busy ward round or quick review rather than lack of reasoning at the time). One would be hard pushed to find a clinician from F1 to Registrar level who could not relate to at least a couple of the topics covered and wished they had had a similar resource earlier. Overall a very useful addition to a clinician’s library and something that I wouldn’t be surprised to find (and indeed would like to see) as a core text in a medical school reading list. I have already recommended it to a number of colleagues. A further excellent publication from a barrister with a wealth of practical experience in understanding how lawyers and experts interact in the field of civil litigation. Following his previous successful book on “Writing medico-legal reports in Civil Claims”, he covers in his latest text the legal language and thinking, evidence, proof, acting as an expert, communication between parties, consent, mental capacity, as well as a final chapter on ‘when things go wrong’. I don’t give 5 stars very often (as there should always be room for improvement), but this one is worth it. This book and its contents benefit from being based on, and written by an author with long-term experience, both in practice and academic teaching and writing on the subject. At the same time, this relatively concise work (140 pages only) provides the up to date necessary knowledge and practical expert help all clinicians need in today’s world, full of ‘…bewildered ignorance, or partial and so faulty understanding…’ of the law related to clinical practice. This book brings together the necessary and practical essence to avoid litigation in the first place but also to assist the legal processes surrounding normal daily clinical practice. 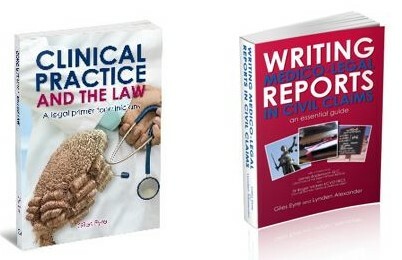 However, when faced with the consequences of the law, or when things go wrong, it will provide invaluable advice, as it is based and follows on from the already well-respected work by the same author ‘Writing Medico-Legal Reports in Civil Claims – An essential Guide’, which has proven indeed to be an invaluable essential guide to regularly consult in my medico-legal practice.